The earliest introduction of domestic chickens and black rats from Asia to the east coast of Africa came via maritime routes between the 7th and 8th centuries AD. In the journal PLOS ONE, an international team of researchers, led by Director Nicole Boivin of the Max Planck Institute for the Science of Human History, used new techniques to analyze ancient DNA and proteins from 496 bone samples from 22 island, coastal and inland sites in eastern Africa. The earliest confirmed samples of chickens and rats were found at open-air island port sites, suggesting the animals were introduced by traders engaged in the robust Indian Ocean maritime trade, and subsequently spread inland. The Swahili coast has long been an important point of contact between Asia and Africa. This cultural region stretching from southern Somalia to northern Mozambique includes many islands, as well as the Comoros and Madagascar. During the Medieval period (7th-15th century AD), maritime trade took off between this region and other areas of the Indian Ocean. Archaeological evidence for this vast trade network includes imported ceramics, glass beads and Asian crops. Now, domestic chickens and black rats can be added to this list, with their earliest introductions in eastern Africa dating to between the 7th and 8th centuries AD. “Archaeologists have been debating the timing, mechanisms and social contexts of the arrival of Asian plants and animals to eastern Africa for a long time,” explains Dr. Boivin, senior author of the study. The competing models are, on the one hand, a very early arrival of Asian species starting around 3000 BC as suggested by some previous studies, and on the other hand, a more modest, mid-first millennium AD arrival in connection with the archaeologically-confirmed maritime trade routes. To address this debate, the researchers analyzed bone samples from 22 sites in eastern Africa, in inland, coastal and island contexts. In total, 52 possible chicken samples and 444 possible rat samples were analyzed. “One challenge for any biomolecular analysis of tropical specimens is the poor preservation of organic materials in hot and humid conditions,” states Dr. Mary Prendergast of Saint Louis University, Madrid Campus, lead author of the study. The researchers thus applied a variety of standard and cutting-edge techniques to analyze both the bones and their ancient DNA and proteins, and undertook radiocarbon dating of the samples. In the case of the black rats, the researchers used Zooarchaeology by Mass Spectrometry (ZooMS) to analyze ancient proteins in the samples and identify species by their so-called “collagen fingerprints.” Because proteins preserve better than DNA in tropical settings, ZooMS offers the possibility of quickly and efficiently identifying species in a wide range of preservation states. The team confirmed the presence of chickens at open-air port sites in Zanzibar as early as the 7th to 8th century AD. People living at these sites are known to have been engaged in maritime trade in the Indian Ocean at this time, and the finding suggests that chickens were introduced through these trade networks. Black rats also appear in the islands in approximately the 7th to 8th century AD at port and cave sites, with a tantalizing potential earliest date of the 5th century AD at the port site of Unguja Ukuu in Zanzibar that requires further confirmation. The rats likely arrived, as they did in many places around the world, as stowaways on trade vessels. The two species do not appear on the mainland until much later, in the second millennium AD. These findings offer important insights and additional evidence of the contact and interactions between the peoples of the Indian Ocean world. Just like today, ancient trade and shipping helped bring new animals, plants and foods, but also spread invasive species. Maritime trade in the Indian Ocean appears to have intensified in the Medieval period, leading to an increase in such transfers. 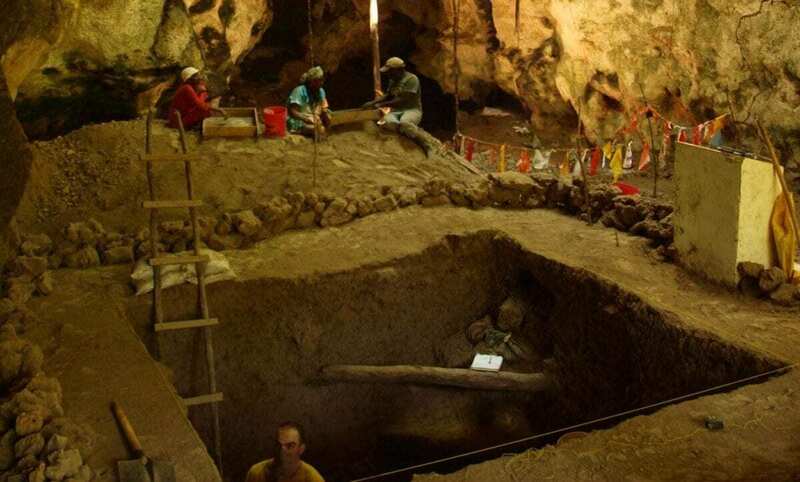 The results of this study also confirm that there were multiple introductions of domestic chickens, today an important food source and ritually significant species, to different parts of Africa at different times. Not all species introductions were so useful. The rats that were carried on ships to East Africa were likely major pests, and the simultaneous appearance on the coast of domestic cats, a pest-control species, was probably no accident. The arrival of rats, a famous vector for the plague, comes close on the heels of the Justinian Plague outbreak of 541-542 BC in the Eastern Roman Empire and around the Mediterranean. Plague today is a disease of serious concern in Madagascar and eastern Africa, where it claims more victims than anywhere else in the world. Rats are also a well-established transformer of ecosystems, and on many islands globally they appear to have contributed to species extinctions after their introduction. Work is currently underway at the Max Planck Institute for the Science of Human History to understand the impacts of rats on eastern African islands, as well as their broader global spread and role in pathogen dispersal.